Comments: ***PLEASE NOTE*** This book has suffered heavy water damage in some areas causing staining or wavy pages. The damage is cosmetic, however it is a useable copy. Regardless of title, CD/DVD/Access Codes or Supplemental Materials are not guaranteed. This is a U.S. Student Edition Book. This book is not a rental. 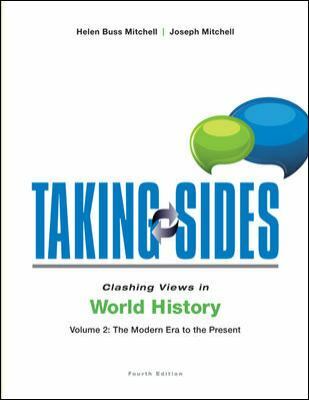 Joseph Mitchell is the author of 'Taking Sides: Clashing Views in World History, Volume 2: The Modern Era to the Present', published 2013 under ISBN 9780078133251 and ISBN 0078133254. Loading marketplace prices 14 copies from $35.05 How does the rental process work?